While many visitors to the Land Down Under instantly think of places like Sydney or the coastline of Queensland, Western Australia offers some incredibly diverse regions without the crowds. There are postcard-perfect white sandy beaches that stretch of miles without another soul in sight and vast expanses of outback. Some say Coral Bay and the Ningaloo Reef are actually very good alternatives to the Great Barrier Reef. Of course, you’ll have to come here to find out for yourself. 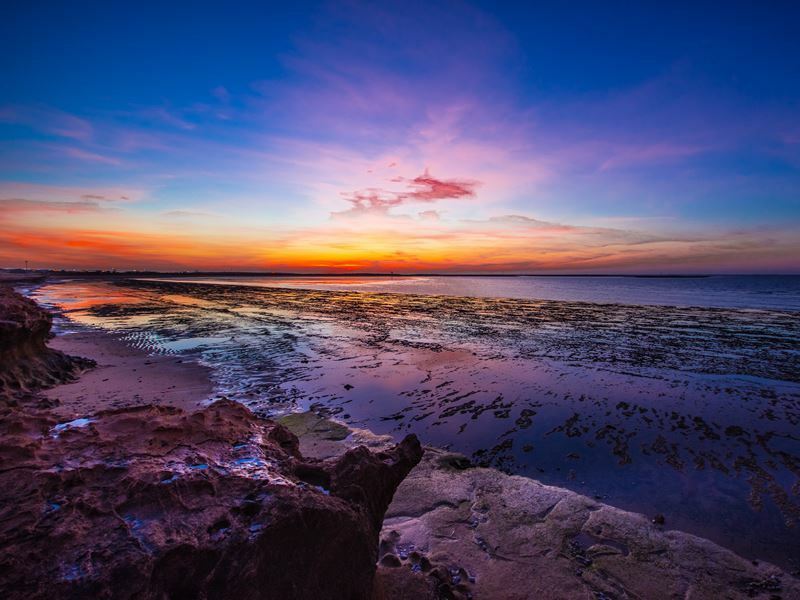 This suggested self-drive from Perth to Darwin will bring you to many of the area’s highlights. 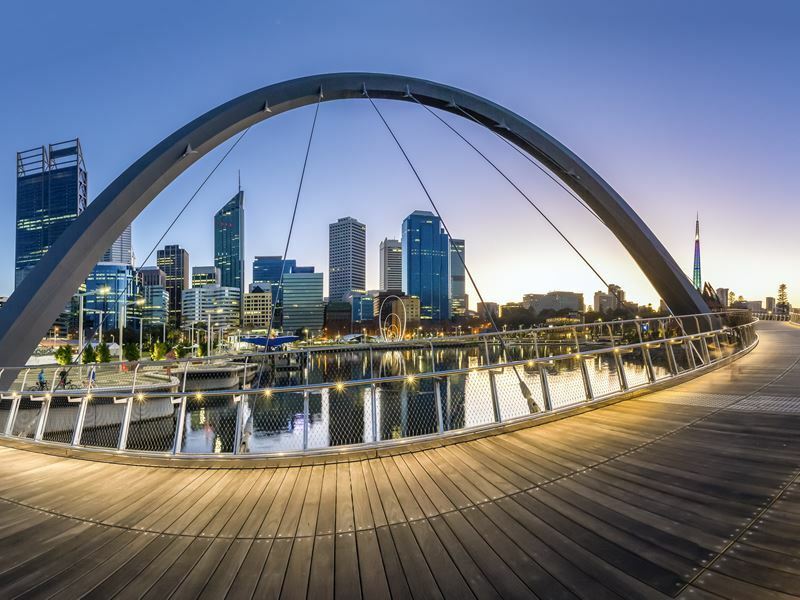 Start your journey in Perth, a city that’s becoming increasingly popular to visit with its laidback atmosphere and tropical climate, thriving food scene, abundance of trendy bars and a revitalized arts community, not to mention a wealth of outdoor adventure that can be enjoyed nearby. You might want to plan to spend a few days exploring, beating the inevitable jetlag before heading out on the road. Swan River runs right through before it joins the sea, and a river cruise is an ideal way to view the city skyline. If you want to relax at the beach, Cottlesloe Beach is just a short drive away as Perth’s top spot for swimming, snorkelling or surfing. This is also one of the best places to watch the sun go down, with especially colourful sunsets marking the end of nearly every day. 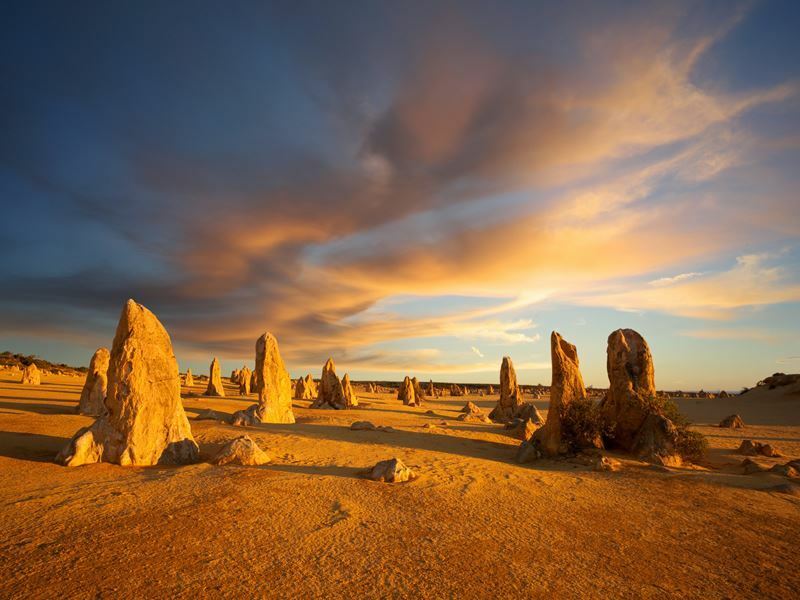 Your first stop after leaving Perth is about 125 miles northwest: Nambung National Park. 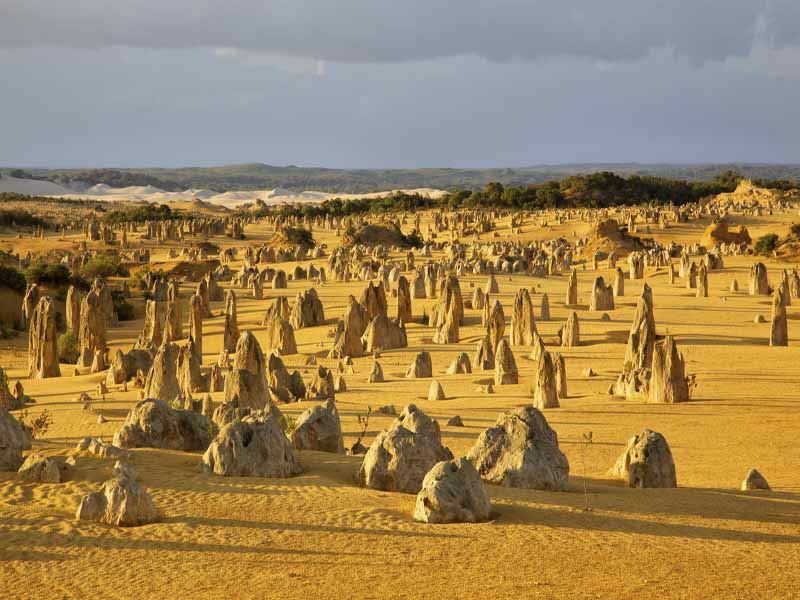 It boasts one of the country’s most unique landscapes, the Pinnacles Desert. This vast area provides natural habitat for a wide range of bird life and native animals, along with magnificent limestone spires that soar from the golden sands of the desert. Some stand over five meters high – gazing out at this scene you might think you were looking at another planet. They were formed around 30,000 years ago following the receding of the sea which left deposits of shells. The wind removed the surrounding sand over time, resulting in the pillars being exposed to the elements. Be sure to watch for the cockatoos, grey kangaroos and emus as you explore, and if you visit nearby Hangover Bay, bottlenose dolphins can often be seen just offshore. Nestled at the mouth of the Murchison River, Kalbarri National Park is a must-detour on the way to Shark Bay. It’s renowned for its abundant marine life and stunning landscapes, carved over millions of years into the sandstone cliffs, and surrounded by magnificent coastline, glistening bays and river gorges. This is a great place for an outdoor adventure, with opportunities for canoeing, gorge hiking and bush walking. 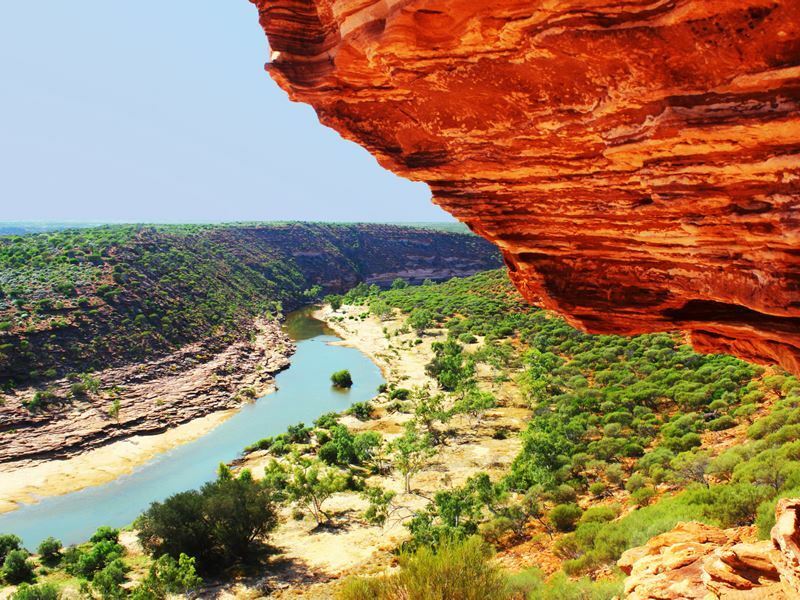 The park’s Murchison River gorges are especially impressive with the dramatic sandstone cliff faces plunging into the river as it winds toward the town of Kalbarri. You’ll be able to view the gorge from lookouts like Nature’s Window, which provides a glimpse through its huge red rock frame. If you visit from July through October, you’ll see the landscape ablaze with brilliant colour, with wildflowers like kangaroo paws, banksias and grevillias all in bloom. While many of the native mammals here are nocturnal, emus and grey kangaroos can be seen during the day. Monkey Mia isn’t famous for monkeys, but for dolphins that are known for their almost daily ritual of swimming to shore to interact with humans. 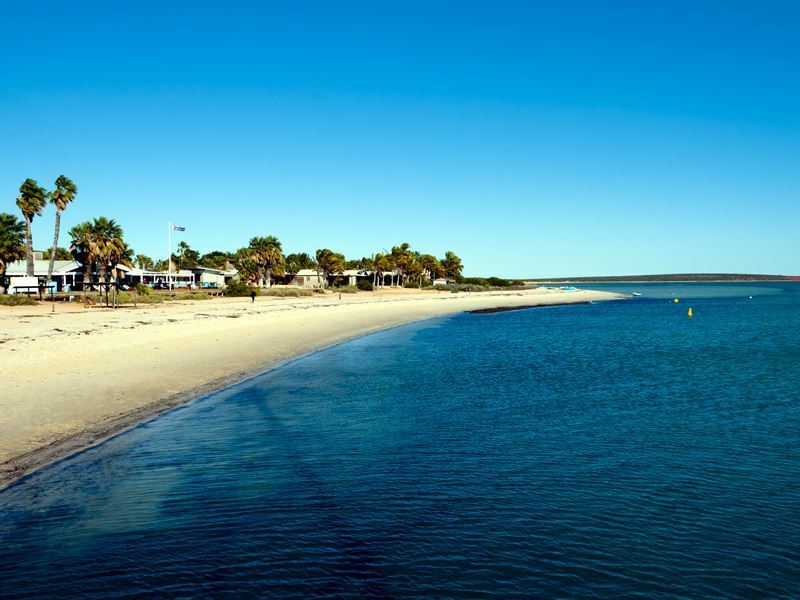 The Monkey Mia dolphins are a must-see for any visitor to Western Australia, located along the eastern shore of the Peron Peninsula, just a short drive from the Shark Bay World Heritage Area. The dolphins draw thousands of visitors to this region every year which is considered to be one of the most reliable spots to encounter wild dolphins in the world. In fact, there have been just four days that the creatures haven’t visited in the past five years. Shark Bay World Heritage area is considered one of the most important wilderness regions on Earth, covering 2.2 million hectares, with its diverse landscape home to an abundance of planet and animal life, including some that can’t be found anywhere else. On any visit, you’re likely to glimpse dugongs, with the world’s largest population inhabiting this area, along with manta rays, sea turtles and whales. Of course, you could just relax and enjoy the scenery, lounging on one of the white sand beaches while gazing out at crystal-clear blue water. This area is also home to world-famous Shell Beach, with its sands as white as snow thanks to the millions of shells that some say are as much as 10 meters deep. It’s made up of coquina bivalve shells which extend from the shoreline into the sea, forming large areas of shells that have fused together over time. Hamelin Pool is well-worth a visit too, with the most abundant and diverse examples of living fossils on the planet, monuments to life on Earth more than 3500 million years ago. Venturing north to Coral Bay, you’ll discover a tranquil beach paradise that’s popular for a variety of water sports, including snorkelling, cruising and swimming with whale sharks. 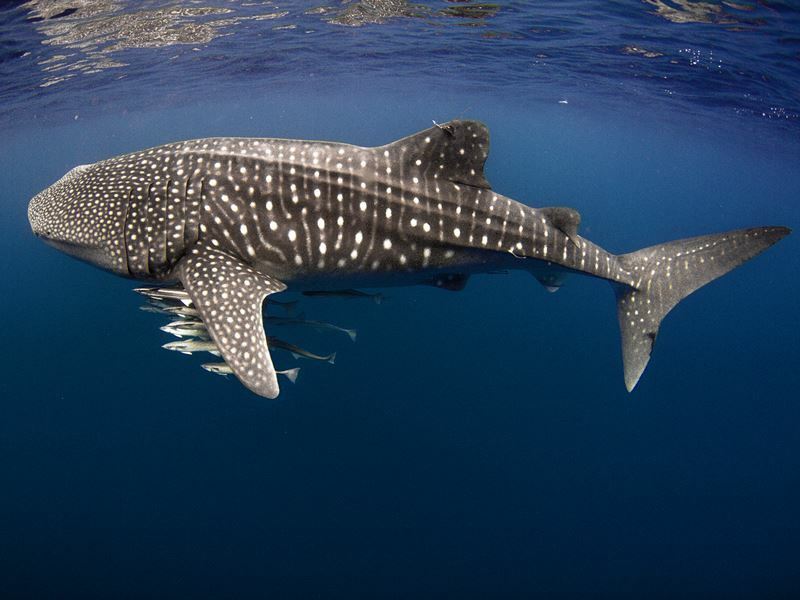 From March through June, you can swim with these creatures that are the biggest fish in the sea. These gentle giants offer the opportunity of a lifetime to visitors who come from across the globe for the experience. While they may be huge, at up to 18 meters long, this area is one of the few spots on the planet where these harmless filter feeders regularly appear in large numbers. The snorkelling at Coral Bay is outstanding – you can walk straight out from the reef from the shore, with prolific Cabbage Coral Gardens teeming with turtles and colourful fish. If you’d rather not get wet, cruises are an option too. Enjoy cruising over spectacular Ningaloo Reef viewing coral gardens and exotic fish through underwater windows. Located just off the North West Coastal Highway as you make your way toward Broome, Karratha makes an ideal base for exploring the natural beauty of the area, which includes the spectacular beach at Hearson’s Cove, a shell beach surrounded by the deep red rocky hills that’s ideal for swimming, and ancient Aboriginal rock engravings on the Burrup Peninsula. You might want to stretch your legs on the Yaburara Heritage Trail, a 3.5-kilometer walk that highlights the natural history and cultural heritage in the area, particularly the traditional inhabitants known as the Yaburara Aboriginal tribe. As you hike the rugged trail, you’ll come to multiple Aboriginal sites, including artefact scatters and rock engravings. The trek offers fantastic views throughout from the hilltop, overlooking the city of Karratha and its surrounds. The second largest town in the Pilbara region, Port Hedland may best be known for its flatback sea turtles. They nest only on the beaches in Australia and have the shortest migratory range of any sea turtle. If you’re here between October and March, there will be hundreds of the animals on the beaches here nesting – and, from December to March the younglings hatch. During the winter months of July, August and September, you’ll be able to view a wide range of native wildflowers by following the Pilbara Wildflowers Trail. Keep an eye out for as many as 65 species of Acacia, along with Sturt’s desert pea, Ashburton pea and Mulla Mulla. This perpetually sunny town in the Kimberley Region is considered to be one of Australia’s most unique wilderness destinations. Here you can enjoy the practically endless stretch of pristine white sands that are framed by brilliant turquoise waters. If you’re up for a big adventure, ride a camel into the sunset on Cable Beach. In the heart of this region you’ll find cascading waterfalls, spectacular gorges and vast wildlife sanctuaries. 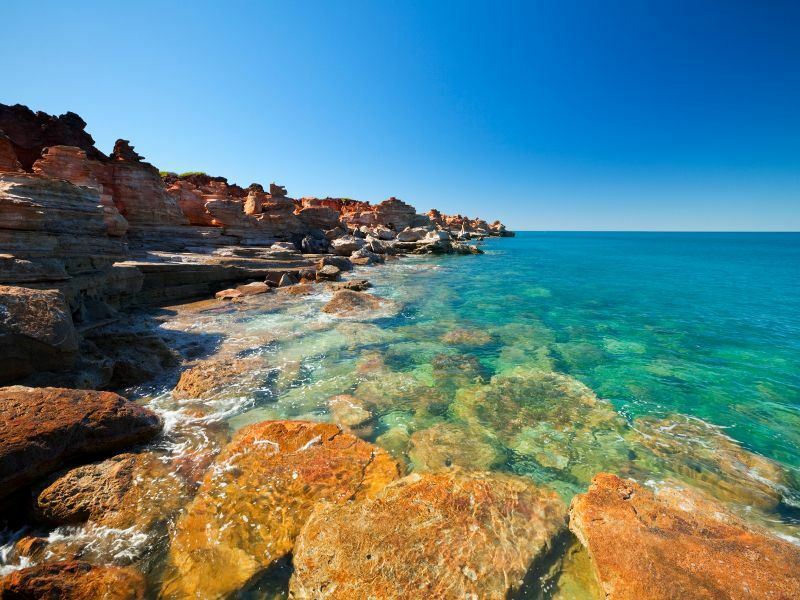 You won’t want to miss exploring the town of Broome itself either. Be sure to stop into the Short Street Gallery which features extensive collections highlighting the distinct and varied styles of Aboriginal tribal groups. In Chinatown, go pearl shopping for a classic souvenir in the finest pearl showrooms in the world. You can learn about pearling history, tour restored luggers, watch a diving demo and sample pearl meat. Kununurra is the gateway town to the East Kimberley. 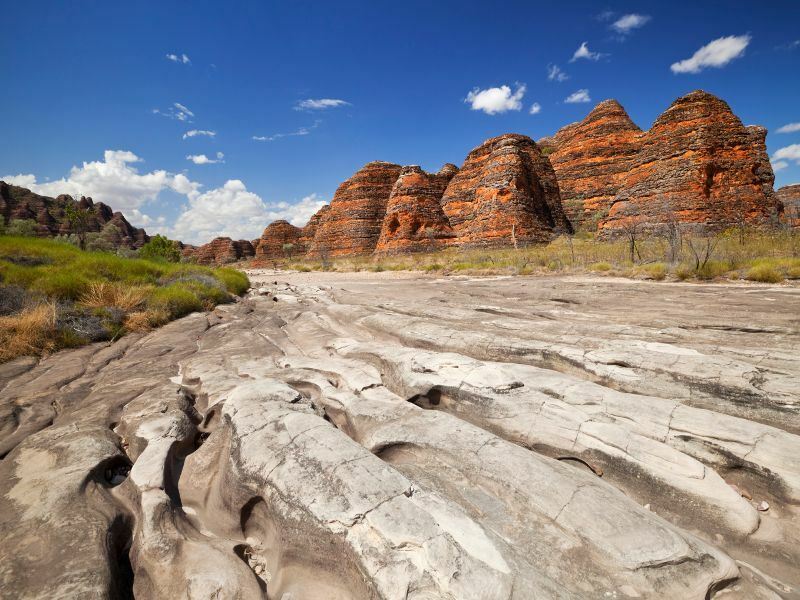 It makes a great base for exploring some of the region’s most impressive natural attractions, including Purnululu National Park and the Bungle Bungle Ranges. Unknown to most until the early 1980s, the Bungles are made up of sandstone domes striped in orange and black, looking as if they’re massive beehives. Created some 350 million years ago, the best way to see them is by taking a scenic flight for a bird’s-eye view. This range can also be explored on foot, where hidden gorges and long narrow chasms can be discovered. Echidna Chasm is at the north end, while Cathedral Gorge and the Bungle Bungle range are in the south. There are trails of varying lengths for nearly all fitness levels, and you might spot some unique native animals along the way such as the short-eared rock wallaby and the nailtail wallaby, along with any one of more than 130 bird species. 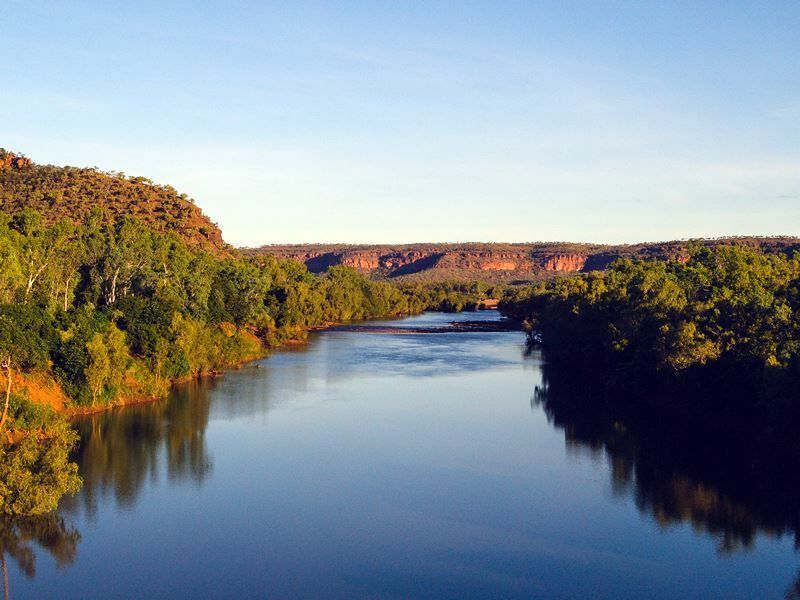 Crossing into the Northern Territory, Victoria River is a tiny settlement just under 200 kilometres west of Katherine. The area around it is considered one of the territory’s most stunning, with ranges rising into huge amphitheatres with rugged cliffs that spill into scree slopes. Just off the highway are multiple short walks that can be taken in Gregory National Park. The Nawulbinbin Walk and Joe Creek Picnic Area are just off Victoria Highway. The 1.7-kilometre loop takes only about an hour to complete and will bring you up the rocky slope to the base of an escarpment wall to take in dramatic views and marvel at local Aboriginal rock art. 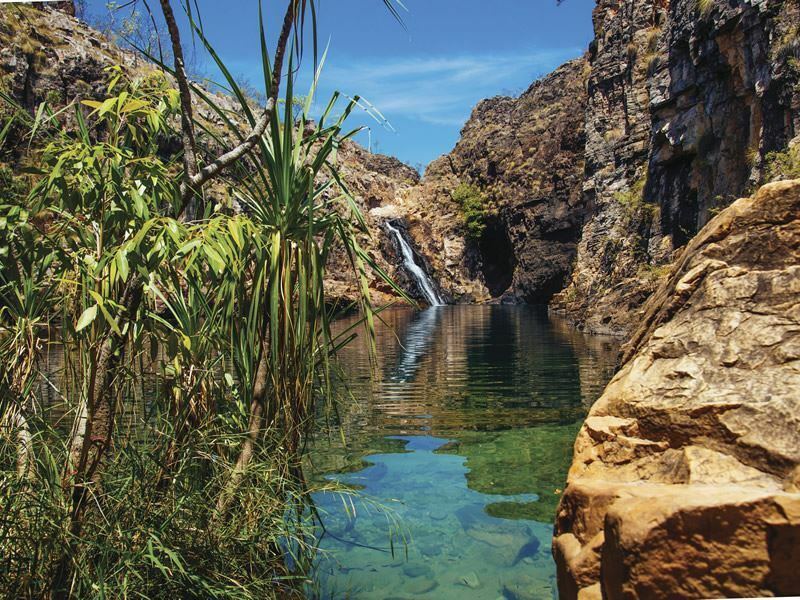 Katherine, known as the place where "the outback meets the tropics,” is located along the Katherine River below “The Top End,” 320 miles southeast of Darwin. It’s home to the interesting Katherine Museum, which is well-worth a visit, but the eye-popping surrounds are what it’s best known for, particularly Katherine Gorge, which is made up of dry bushland with pockets of rainforest, water holes and streams. Whatever there is water, you’re likely to spot all sorts of wildlife, including freshwater crocodiles. This is a wonderful lplace to walk, including the one-hour Baruwei Lookout Walk that offers an impressive view of Katherine River. There are long challenging treks for serious bush walkers, but the best way to experience the area with a more limited amount of time is to take a cruise. There are multiple options that include guides, providing fascinating insight into both the scenery and the local Jawoyn people. Cruising through the still waters of Yellow Water is really a must, bringing opportunities to view a wide variety of magnificent flora and fauna, incredible scenery. 50,000-year-old rock art and over 5,000 sacred Aboriginal sites. You’ll glide along the water through mangroves, pandanus and tropical trees, watching for wild horses, crocodiles, over 60 species of birds and more. The excursion also includes a walk through the Nourlangie Art Site for admiring rock art that’s thousands of years old. Finally, as you make your way to the tropical city of Darwin, which hugs the coastline in the Northern Territory, you won’t want to miss stopping for a cruise on the Adelaide River to see the jumping crocodiles. Viewing them in the wild is a very unique experience – the most popular in the Darwin area, and the vessels will get you as safe as you can get, as if you can almost touch them, from behind thick glass windows. 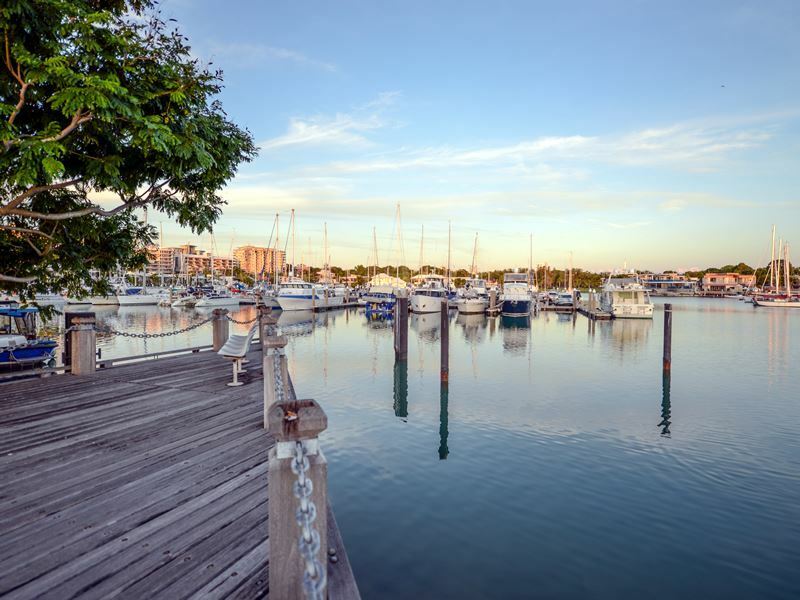 In Darwin itself, you’ll experience a place with a Bali-like feel, and a waterfront area that’s surrounded by cool cafes, laid-back bars, seafood restaurants and shops. Mitchell Street is famous for its buzzing nightlife scene. Right in the heart of the city you can even climb into a Perspex tube called the “Cage of Death,” at Crocosaurus Cove. The daring can head right into the crocodile enclosure for an eye-to-eye look at one of the toothy animals. Quite the unforgettable way to cap off this holiday through Western Australia.